A new feature of the association between the equatorial electrojet and the solar wind parameters during the main phase of the magnetic storm on 24-25 September 1998 has been detected. A negative pulse in the horizontal magnetic field, H exceeding 200 nT at Trivandrum, India simultaneously with a positive pulse of more than 200 nT at Huancayo, Peru were recorded between 06-07 UT on 25 September 1998. The reversal of the sign of H pulse happened at station near the sunrise sector. The negative pulse in the Indian sector showed enhancement of the magnitude at the magnetic equator, while the positive pulse in the midnight sector was observed at all stations with similar magnitude. The ionograms at Thumba showed complete absence of equatorial sporadic-E (Es-q) echoes during the negative H impulse. Very strong equatorial spread-F echoes were recorded in ionograms over Jicamarca during the night of 24-25 September 1998 which continued even after the sunrise at frequencies beyond foF2. The event has been shown to be associated with the sudden increase of solar wind density from 5 to 22 ions per cm3. This suggests a transient and impulsive interaction between solar wind and the magnetosphere because of an excess momentum directly. This can lead to impulsive penetration of solar wind plasma into the magnetosphere that results in a westward electric field in the ionosphere generated during the daytime and a positive electric field in the night time ionosphere. This dusk-dawn electric field imposed in the ionosphere primarily due to a large impulse in solar wind density points to a new relationship between solar wind and magnetosphere of the earth and needs further investigation. Keywords: Magnetic storm, Magnetic equator, Ionograms, Solar wind parameters, Magnetosphere Dusk-dawn electric field. Miniaturized microfabricated micro-mechanical or micro-electro-mechanical sensors (MEMS) have enabled different modes of transduction that involve nano-mechanical motion. As a result, enormous potential in chemical and biological domains have emerged. Among a variety of MEMS-based sensors, polymer microcantilevers modified with sensitive layers have attracted significant interest due to its small size, high sensitivity, and the possibility to integrate multiple sensors. Further, the microcantilever technology offers rapid, label-free, and in situ detection of specific bio/chemical analytes. In this review article, six important aspects of polymer microcantilever sensors such as: operation principles; fabrication of polymer microcantilevers; characterization; readout principles; and various bio/chemical applications have been discussed. ©Anita Publications. All rights reserved. Keywords:Microcantilever, surface micromachining, Polymer MEMS, Optical/Electrical readout, Biosensing, Vapor-phase detection, Soil moisture. An e-nose based on SnO2 thin film comprising 10 sensing elements for determination of toxic gases was successfully designed and developed. An e-nose comprises of three main components namely multiple sensor arrays, data acquisition system and a pattern recognition algorithm. A multiple sensor array of dimension 1.3 cm × 2.5 cm is realized using thermally evaporated SnO2 thin films (~900 nm thick) modified with different sensitizers. To realize 10 sensing elements, SnO2 thin film was modified with 4 sensitizers namely Cu, Fe, Au and Ag with 10 nm thickness with selective masking. A data repository was developed by recording the response curves as a function of operating temperature, gas and its concentration. The fabricated e-nose was subjected to different gases namely NH3, H2S, NO, NO2, CO, CO2, LPG and C2H5OH. Of these gases the e-nose responded only towards H2S, NO and NO2. Measured data (SR values) was plotted on a bar plot and a unique response pattern of the sensor array was obtained for three gases namely, H2S, NO and NO2. This unique pattern was used for both qualitative and quantitative determination of the three gases. Thus, the developed e-nose can successfully detect three gases namely H2S, NO, NO2 at concentrations ranging between 1 and 10 ppm. © Anita Publications. All rights reserved. The Density Functional Theory has been invoked to investigate the nonlinear optical and charge transfer properties of Phenanthrene (Phen) on silver cluster. Theoretical computations on the shifting of frontier molecular orbitals from HOMO to LUMO, Natural population analysis (NPA) and the orbital overlapping between silver cluster and Phen in NBO analysis have been correlated to charge transfer from silver to Phen. Significant reduction identified in the band gap of Phen after adsorption on silver coupled with a redistribution of electron density in the molecular electrostatic potential (MEP) confirms the direction of charge transfer consequently to the process of adsorption. Additionally, an enhancement in the calculated dipole moment and polarizability values are also obtained. Based on the Time-Dependent Density Functional Theory (TDDFT), surface resonance peaks in the simulated UV-Vis spectra were obtained at 404 nm with major contributions due to the charge transfers from silver cluster to Phen. Enhancement in the first order hyperpolarizability of Phen-Ag suggests its potential applications in the design of NLO devices. ©Anita Publications. All rights reserved. 1. Zhang L, Cao Y, Colella N S, Liang Y, Brédas J L, Houk K N, Briseno A L, Acc Chem Res, 48(2015)500-509. 3. Chandrakantha B, Isloor A M, Sridharan K, Philip R, Shetty P, Padaki M, Arab J Chem, 6(2013)97-102. 4. Manjunatha M G, Adhikari A V, Hegde P K, Sandeep C S S, Philip R, J Mater Sci, 44(2009)6069-6077. 4. Manjunatha M G, Adhikari A V, Hegde P K, Sandeep C S S, Philip R, J Polym Res, 17(2010)495-502. 5. D’silva E D, Rao D N, PhilipR, Butcher R J, Rajnikant, Dharmaprakash S M, J Phys Chem Solids,72(2011)824-830. 6. Rekha T N, Umadevi M, Rajkumar B J M, J Mol Struct, 1079(2015)155-162. 7. Thomas J J, Krishnan S, Sridharan K, Philip R, Kalarikkal N, Mater Res Bull, 47(2012)1855-1860. 8. Hussain J I, Kumar S, Hashmi A A, Khan Z, Adv Mater Lett, 2(2011)188-194. 9. Smitha S L, Nissamudeen K M, Philip D, Gopchandran K G, Spectrochim Acta, A71(2008)1186-1190. 10. 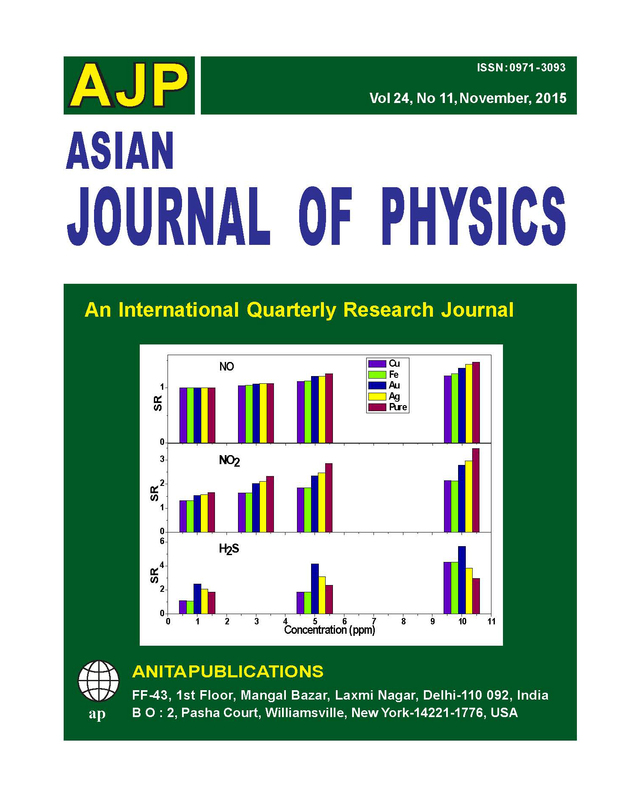 Wang H, Qiao X, Chen J, Ding S, Colloid Surf A Physicochem Eng Asp, 256(2005)111-115. 11. Chen H M, Liu R S, J Phys Chem C, 115(2005)3513-3527. 12. Huang T, Hao Z, Gong H, Liu Z, Xiaob S, Li S, Zhai Y, You S,Wang Q, Qin J, Chem Phys Lett, 451(2008)213-217. 13. Nagao H, Awazu K, Hayakawa S, Iwamoto K, Toyoda M, Ichihara T, Eur Phys J, D45(2007)279-287. 14. Salian U, Srinivas S, Jellinek J, Chem Phys Lett, 345(2001)312-318. 15. Huang M J, Watts J D, Phys Chem Chem Phys,14(2012)6849-6855. 16. Rekha T N, Rajkumar B J M, Can J Phys, 93(2015)318-325. 17. Karabacak M, Cinar M, Kurt M, Poiyamozhi A, Sundaraganesan N, Spectrochim Acta, A117(2014)234-244. 18. Krishnakumar V, Barathi D, Mathammal R, Spectrochim Acta, A86(2012)196-204. 19. Kavitha E, Sundaraganesan N, Sebastian S, Kurt M, Spectrochim Acta, A77(2010)612-619. 20. Gayathri R, Arivazhagan M, Spectrochim Acta, A81(2011)242-250. 21. Sergeeva A P, Piazza Z A, Romanescu C, Li W L, Boldyrev A I, Wang L S, J Am Chem Soc,134(2012)18065-18073. 22. Olivella M A, P. Jové, A. Bianchi, C. Bazzicalupi, L. Cano, Chemosphere 90 (2013) 1939–1944. 23. Frisch M J, Trucks G W, Schlegel H B, Scuseria G E, Robb M A, Cheeseman J R, Montgomery J A (Jr), Vreven T, Kudin K N, Burant J C, Millam J M, Iyengar S S, Tomasi J, Barone V, Mennucci B, Cossi M, Scalmani G, Rega N, Petersson G A, Nakatsuji H, Hada M, Ehara M, Toyota K, Fukuda R, Hasegawa J, Ishida M, Nakajima T, Honda Y, Kitao O, Nakai H, Klene M, Li X, Knox J E, Hratchian H P, Cross J B, Adamo C, Jaramillo J, Gomperts R, Stratmann R E, Yazyev O, Austin A J, Cammi R, Pomelli C, Ochterski J W, Ayala P Y, Morokuma K, Voth G A, Salvador P, Dannenberg J J, Zakrzewski V G, Dapprich S, Daniels A D, Strain M C, Farkas O, Malick D K, Rabuck A D, Raghavachari K, Foresman J B, Ortiz J V, Cui Q, Baboul A G, Clifford S, Cioslowski J, Stefanov B, Liu B G, Liashenko A, Piskorz P, Komaromi I, Martin R L, Fox D J, Keith T, Al-Laham M A, Peng C Y, Nanayakkara A, Challacombe M, Gill P M W, Johnson B, Chen W, Wong M W, Gonzalez C, Pople J A, Gaussian 03, Revision B.03; Gaussian Inc.: Pittsburgh, PA, 2003. 24. Gorelsky S I, S Wizard program, revision 2.0, <http://www.sg-chem.net/>. 25. Balachandran V, Rajeswari S, Lalith S, Spectrochim Acta, A113(2013)268-280. 26. Govindarajan M, Karabacak M, Suvitha A, Periandy S, Spectrochim Acta, A89(2012)137-148. 27. Gunasekaran S, Rajalakshmi K, Kumaresan S, Spectrochim Acta, A112(2013)351-363. 28. Sheela N R, Muthu S, Sampathkrishnan S, Spectrochim Acta, A120(2014)237-251. 29. Krishnakumar V, Barathi D, Mathammal R, Spectrochim Acta, A86(2012)196-204. 30. Esme A, Sagdinc S G, J Mol Struct, 1048(2013)185-195. 31. Karthick T, Balachandran V, Perumal S, Nataraj A, J Mol Struct,1005(2011)202-213. 32. Gayathri R, Arivazhagan M, Spectrochim Acta, A81(2011)242-250. 33. Guidara S, Ahmed A B, Abid Y, Feki H, Spectrochim Acta, A127(2014)275-285. 34. Krishnakumar V, Murugeswari K,Surumbarkuzhali N, Spectrochim Acta, A114(2013)410-420. 35. Reed A E, Weinhold F, Curtiss L A, Pochatko D J, J Chem Phys, 84(1986)5687-5705. 36. Jayabharathi J, Thanikachalam V, Jayamoorthy K,Perumal M V, Spectrochim Acta, A97(2012)131-136. 37. Kleinman D A, Phys Rev, 126(1962)1977-1979. Molecular structure and properties of 2,3,4-Trimethoxybenzaldehyde (TMB) were investigated by X-ray diffraction technique and vibrational spectroscopy. The experimental results are supported with computational studies using the density functional theory (DFT), with the Becke-3-Lee-Yang-Parr (B3LYP) functional and the 6-311+G(3df,p) basis set. Potential energy distribution (PED) and potential energy surface (PES) analyses were performed to identify characteristic frequencies and reliable conformational investigation, respectively. The compound TMB (C10H12O4) crystallizes in monoclinic space group P21/c with the unit cell dimensions: a = 12.1046(13) Å, b = 7.0937(12) Å, c = 11.6557(12) Å, β(°) = 109.931(3). In general, the computed parameters are in good agreement with the reported experimental data. The highest occupied and lowest unoccupied molecular orbitals (HOMO and LUMO) of the compound were also analyzed. ©Anita Publications. All rights reserved. Using a simple variational method, we have studied the thermoelectric power Q(T) at zero magnetic field as a function of temperature of rare earth manganites doped with alkaline earths namely, Re1-x AxMnO3 (where Re = La, Pr, Nd etc., and A = Ca, Sr, Ba etc.) which exhibit Colossal Magnetoresistance (CMR), metal- insulator transition and many other poorly understood phenomena. Here, we report the effects of the model parameters e.g. local Coulomb repulsion U, strong ferromagnetic Hund’s rule coupling JH between eg and t2g spins, hybridization Vk between ℓ– polarons & d- electrons of same spins on Q(T). It has been found from our results that Q(T) is positive at low temperatures and shows a pronounced peak at the metal – insulator transition which gets sharpened with alkaline earth doping x and shifts towards the high temperature region. Similar effects are observed on increasing JH also but on the contrary the magnitude of Q(T) decreases on increasing Vk and peak at low temperature becomes broader & shifts towards the high temperature region. The observed broad peak may be explained on the basis of the spin – wave theory and may be attributed to the magnon drag effect which increases with x or JH value. Q(T) as a function of temperature computed from this method is, generally, in good agreement with the available experimental data. ©Anita Publications. All rights reserved. Keywords: Magnetic materials, Colossal Magnetoresistive Manganites, Variational techniques,Transport properties, Thermoelectric power. In the present work, polythiophene-polyethylene oxide (PTh-PEO) polymer composite was synthesized by an in situ chemical oxidative polymerization method. PTh-PEO polymer composite films were characterized through scanning electron microscopy (SEM) and thermogravimetry analysis (TGA) and Differential Scanning Calorimetry (DSC). Pure PTh-PEO and doped PTh-PEO polymer composite with lithium perchlorate (LiClO4) as sensors were prepared by screen-printing method on cladophora substrate followed by Al2O3 layer. The sensors were used for CO2 gas sensing detection at room temperature. Dynamic and static sensing response of both pure and doped sensor was studied. Sensitivity of sensors at different concentration (ppm) of CO2 gas was measured. The variation of sensitivity with CO2 gas concentration is found to be linear. At certain higher concentration of CO2 gas, saturation effect was observed in both sensors. Doped PTh-PEO composite sensor shows maximum sensitivity in presence of CO2 gas. The reproducibility and stability for both sensors were good. ©Anita Publications. All rights reserved. Keywords: Polythiophene, Polymer Composite, Sensing response, CO2 gas. 1. McQuade D T, Pullen A E, Swager T M, Chem Rev, 100(2000)2537-2574. 2. Miasik J J, Hooper A, Tofield B C, J Chem Soc, (Faraday Transactions), 82(1986)1117-1126. 3. Gardner J W, Bartlett P N, Electronic Noses, (Oxford University Press, London), 1999, p 78. 4. Roncoli J, Chem Rev, 92(1992)711-738. 5. McCullough R D, Adv Mater, 10(1998)93-116. 6. Hanawa T, Kuwabata S, Hashimoto H, Yoneyama H, Synth Met, 30(1989)173-181. 7. Maier J, Holziger M, Sitte W, Solid State Ionics,74(1994)5-9. 8. Ishihara T, Kometani K, Sensors and Actuators, B 28(1995) 49-54. 9. Waghuley S A, Yenorkar S M, Yawale S S, Yawale S P, Sensors and Transducers,79(2007)1180-1185. 10. Yawale S P, Pakade S , J Mater Sci (UK), 28(1993)5451-5455. 11. Batzill M, Diebold U, Progress in Surface Science, 79(2005)47-154. 12. Lin C W, Hwang B J, Lee C R, Mater Chem Phys, 55(1998)139-144. The renewed interest in the study of the VLF propagation anomalies due to perturbations in the D-region electron densities under various solar/stellar and geophysical phenomena requires the availability of suitable simulation model as well as a baseline D-region electron density model for the region of interest. A Full Wave Model (FWM) for computing VLF propagation anomalies has been developed and tested by comparing results from a similar model for a given VLF path. The simulation has also been carried out under different conditions of D-region electron density profiles and the anomalies in VLF amplitude and phase for a sample propagation path determined to check the sensitivity of the model. Further work with new observations, computations of the D-region electron density profiles using measured solar radiation fluxes and simulation pertaining to different VLF networks will be required before the technique can be effectively used to identify and confirm anomalies pertaining to new applications. ©Anita Publications. All rights reserved. Keywords: VLF propagation, Full Wave Model (FWM), Solar radiation, Ionosphere. 1. Maynard N C, HaleL H, Mitchell J D, Schmidlin F J, Goldberg R A, Barcus J R, Søraas F, Croskey C L, J Atmos. Terr Phys, 46(1984)807-817. 2. Chakravarty S C, Nagaraja K, J Atmos Sol Terr Phys,132(2015)135-146..
3. Chakravarty S C, AIP, CP1286(2010)83-102. 4. Hayakawa M, Sensors, 7(2007)1141-1158. 7. Deeks D G, Proc Roy Soc, 291(1966)413-437. 9. Booker H G, Phil Trans A, 237(1939)411-451. 10. Nagano I, Mambo M, Hutatsuishi G, Radio Sci, 10(1975)611-617. 12. Viertel W A, Sechrist C F, Full wave calculations of reflection coefficients from D-region electron density profiles, Aeronomy Report No.33. (University of Illinois, Urbana), 1969. 13. Chakravarty S C, Gupta S P, Chandrasekaran S, Adv Space Res, 20(1997)2181-2189. 14. Swamy Balachandra, Astrophys Space Sci, 185(1991)153-164. 15. Lynn Kenneth J W, AIP, CP1286(2010)3-43. 16. Crombie D D, Radio Science, 68D(1964)27-34. 17. Mitra A P, Ionospheric Effects of Solar Flares, (Springer, New York), 1974. 18. Kasturirangan K, Sharma D P, Rao U R, Rastogi R G, Chakravarty S C, Astrophy Space Sci. 42(1976)57-62. 19. Edwards P J, Burtt G J, Knox F, Nature, 222(1969)1053-1054. 20. Fishman G J, U S Inan, Nature, 331(1988)418-420. 21. Inan, U S, Lehtinen N G, Lev-Tov S J, Johnson M P, Bell T F, Hurley K, Geophys Res Lett, 26(1999)3357-3360. 22. Sasmal S, Chakrabarti S K, Nat Hazards Earth Syst Sci, 9(2009)1403-1408.